Mariamawit Mikiyas, a three-month-old baby, with her relative, Embet Matebe, being seen by nurse Nega Alemneh. Image by Gonzalo Guajardo for Communication for Development Ltd.
Ethiopia has made great progress in many aspects of its health system including management and governance, increasing access to health services, strengthening financing mechanisms, improving the logistics system, and increasing the availability of human resources for health. As a result, health outcomes have improved. Ethiopia achieved the Millennium Development Goal 4 target of reducing child mortality by two-thirds before the target year of 2015. Yet, there are still many challenges. Though reduced in recent years, maternal mortality remains high and the country carries major health burdens due to communicable diseases and nutrition-related disorders. In terms of health financing, per capita health spending is only about US$20.77 per year, about one-third of which is out-of-pocket spending at time of sickness. As households are paying at the time of sickness, costs can be prohibitive and when households decide to seek services it can be catastrophic and impoverishing. Expanding the evidence base for health financing decision-making. USAID/Ethiopia’s bilateral the Health Sector Financing Reform (HSFR) project ended in 2013. Technical assistance continues through the HFG Project (HSFR/HFG). HSFR/HFG supports the Federal Ministry of Health (FMOH), Ethiopian Health Insurance Agency (EHIA), Regional Health Bureaus (RHBs), Woreda (district) Health Offices, health facilities, and other stakeholders in all regions and two city administrations of the country. Health insurance provides financial risk protection to citizens, which results in increased demand for and use of health services. HSFR/HFG supports the Government of Ethiopia in implementing community-based health insurance (CBHI) to benefit Ethiopian citizens engaged in the informal sector and with preparations for payroll-based social health insurance (SHI) for formal sector employees. CBHI: The HSFR bilateral project provided technical support to the Ethiopian government in piloting CBHI in 13 woredas in Amhara, Oromia, SNNP, and Tigray, the largest four regions in Ethiopia. HSFR/HFG evaluated the pilot program and found that, on average, more than 50% of eligible households have enrolled in the CBHI schemes. CBHI members are utilizing health care services more than twice as much as non-CBHI members. Based on impressive results of the pilot phase, HSFR/HFG supported the government to design and implement a national CBHI program scale-up strategy targeting over 80% of the Ethiopian population that is engaged in the informal sector. CBHI is being expanded from 13 to 350 woredas in 2017. As a result, more than 14.5 million people have health insurance coverage through CBHI. Click here to view a short video in which three CBHI beneficiaries share how the insurance program has impacted their lives. SHI: HSFR/HFG provides technical support to EHIA with preparations to launch SHI to citizens employed in the formal sector. Technical support includes preparation and capacity building in collecting premiums, refining provider payment mechanisms, and awareness-raising of formal sector employers and employees across the country. HSFR/HFG also provided technical support to develop the legal framework for establishing EHIA, thereby institutionalizing a health insurance system in the country. 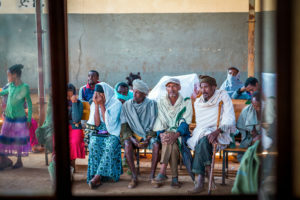 Patients wait for their turn to be seen at the Mecha Health Center. Image by Gonzalo Guajardo for Communication for Development Ltd.
Revenue retention and utilization: HSFR/HFG advocates to the government to deploy finance staff to health facilities and trains facility staff to properly collect and use internally generated revenue to pay for targeted interventions and commodities prioritized for health service quality improvements. These include procuring essential drugs, commodities, and equipment, upgrading physical infrastructure, and paying for critical utilities such as electricity and water supply. Private wings in public hospitals: Private wings in public hospitals are a mechanism to improve retention of key clinical hospital staff by enabling them to earn additional income, generate additional hospital revenue, and provide alternatives for users of private hospital services. The project provided technical support on the development of a prototype private wing guideline and its use for expansion of private wings in public hospitals. 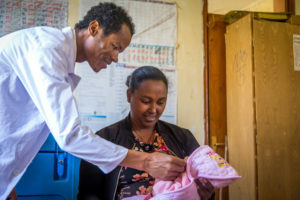 Thus far, 54 public hospitals across all regions of Ethiopia have established private wings, and HSFR/HFG is supporting expansion of this initiative. Outsourcing non-clinical services at public hospitals: This HCF reform allows hospital management and clinical staff to focus on their core work of delivering quality health care, while auxiliary services such as laundry, security, and catering are outsourced. HSFR/HFG developed protocols and detailed guidelines for outsourcing and provided technical assistance to facilities through supportive supervision. So far, 71 hospitals have outsourced one or more non-clinical services. Outsourcing results in efficiency gains and resource saving. Governing boards: HSFR/HFG contributes to strengthening Ethiopian health facility governance structures by supporting the establishment and functioning of facility governing boards. Almost all health facilities in the target regions have established governing boards which have taken decisions resulting in fewer stock outs, health facility infrastructure upgrades, improved availability and functioning of diagnosis equipment, and increased utilization of quality health services. HSFR/HFG developed a comprehensive health facility governance training manual and is strengthening the capacity of boards to be responsive and accountable to local communities. Health Accounts: HSFR/HFG provided technical support for Ethiopia’s fifth and sixth rounds of Health Accounts, including assistance with data collection, analysis, report writing, and dissemination. The Federal Ministry of Health used findings from the fifth round of Health Accounts in its budget negotiations with the Ministry of Finance and Economic Development to advocate for more government funding for health. The sixth round of Health Accounts uses the WHO System of Health Accounts 2011 (SHA 2011) methodology. This round included an institutional survey of donors, NGOs, employers, and insurance companies as well as tracking of government health expenditure from Ministry of Finance. Additionally, a household health expenditure survey and a survey of people living with HIV/AIDS to obtain evidence on where people go for health care, why, and how much they spend were also undertaken. Data from successive Health Accounts on the percentage of household expenditures going to health also provides the Federal Ministry of Health with solid evidence to support the design and introduction of CBHI and SHI. Supportive supervision and routine monitoring: HSFR/HFG conducts quarterly supportive supervision of representative health facilities and woreda government offices. Supportive supervision visits are aimed at collecting data on and assessing overall progress and performance in implementing HCF reforms. The project team provides on the spot technical support during visits and provides feedback to counterparts at different levels of the health system. Supervision data is compiled, analyzed, and shared during periodic review meetings held at the federal, regional and sub-regional levels. HSFR/HFG produces an annual synthesis report that consolidates supportive supervision data and includes key findings and recommendations. These reports are used regularly by the FMOH and regional and woreda authorities as data sources and to guide HCF reform implementation strategies and corrective actions. Additionally, HSFR/HFG collaborates and participates in integrated supportive supervision led by the FMOH and RHBs.